Born in the farmlands of Maine and eventually migrating towards the tiny city of Boston, Ellei Johndro was an artist from her early years. A nature girl at heart, one of her first artistic endeavors was the process of slowly peeling the white bark from birch trees and using it for painting paper and writing letters to friends. By the time she was 12, she was sculpting full figure comic characters and unusable ceramic mugs. From pottery making she quickly progressed to the art of airbrushing for a very short time before her options were enlightened with a photography class at the age of 14. It was that first class under the tutorial of Mr. Chop which opened her eyes and nose to the sensation of a manual black box and wonderfully scented chemicals. Day in and day out the images were printed and mounted and after a brief three months of passionately working, her first image “Solidified” was entered into a student competition. Ellei was commonly referred to as the next Margaret Bourke-White, but after four years of immersing herself in the art, her true interests and influences became Edward Weston, Lewis Hine, Andre Kertesz, Henri Cartier-Bresson and Robert Frank. The essence of capturing the moment as well as the true and realistic ways of life were her passion. Her first gallery show was held in Boston at L’Attitudes in 2002 for her street life collection. states, she quickly packed up and drove to the West Coast where she continued her exploration and immersion into nightlife. Ellei continues to document urban subcultures and street life while maintaining her events under the Shadowscene brand. She may not peel the bark off birch trees anymore, but she definitely leaves a trail of chaos from coast to coast on her annual tours. Thankfully, it’s all chronicled here on Shadowscene. Announcing a new photo exhibit from Ellei Johndro hosted at Philly’s EXIT Skateshop. After four long years, PW has launched a nightlife section and kicked if off with a feature on our weekly, Tigerbeats. Deli profiles “Renaissance Woman” Ellei Johndro. See the full story here. Pearls for the Swine interviews Ellei Johndro on her habits for Sunday Fundays! Full interview feature on what it’s like in the world of Shadowscene / Ellei Johndro. Self/Glamour Mag China did a night life feature focusing on the best hot spots and fashion around the world. Ellei’s photos put some of our favorite venues on the map. Launch party for US wide Pabst Blue Ribbon sponsored art tour including selects from Ellei J. with FMW & Phrequency. Images featured as wheatpastes and city art murals. Phrequency’s Fall Fashion line-up is here featuring one of my select must have accessories for this season. See the full story. FADERs Uncapped series hit up Philadelphia with Young Chris & Freeway. Check out Shadowscene coverage on FADER. Raw Femme, aka Rawky, is a fantastic fancy full on funktastic gal. I was definitely honored to be featured on her site. Muchos thanks. Another SXSW, another fun collab with the UO crew and or buds Sun Airway. Here are some of this year’s stunts…and fashion. Beyond an honor to open for my friends, The Deathset, for their new EP Release at CYP2. See pics. Check video. Biker Daughter first official video for “Carnivore” also included on MTV’s The Seven Premiere. Eat it up. This month Shadowscene was honored to be interviewed by Jacci Stallone for her rad blog, Being Perfect Is Hard. Thank you, Jacci! Music Mondays on the UO Blog features a select track from Biker Daughter this week. Beyond thrilled! Shadowscene is treking the East Coast as both musician, Biker Daughter, and photographer. Ellei is teaming up with label mate and good friend, Kenan Bell. Stay tuned! Ellei has announced her new endeavor and musical side project, Biker Daughter. EP is available for free download now from Sonata Contata. Followand Like or whatever. Part two of Ellei’s retrospective hits the city of Philadelphia for a 6 week run. Glimpse a few of the “Fragments & Figmentations” collection kicking off tonight at Atlantis. This month for SXSW, Ellei is featured alongside Tom Windish as in industry insider on the UO blog for music…check it out now and download free tunes! This month, Cliche Magazine showcases a 2 page spread of Shadowscene approved street fashion. Feature on Mad Mondays and Lykke Li with photos by Ellei J. in this month’s SPIN. FORTH Magazine hosts Ellei’s first magazine cover. Coining Ellei as an underground documentarian of the ‘new weird’ and praising her decade of work, FORTH releases a full story of an evening with Ellei and her adventures. Ellei + Shadowscene is a cover feature in this month’s issue of Cliche Magazine. Find out where Shadowscene orginiated. Ellei Johndro aka Shadowscene is included in the annual ‘Who’s Who’ of Los Angeles. Thank you Los Angeles!! A solo exhibit by Ellei J. encompassing a selection of images focusing on the dream-like moments and surreal nightlife she has spent the past 6+ years documenting. Today marks the first official day that Shadowscene’s now trademarked! Woo! Acura put together a touring art show with five artists from around the country including Ellei who was chosen as the featured artist to represent all of Los Angeles. Samples of her work will spend the summer touring the US. 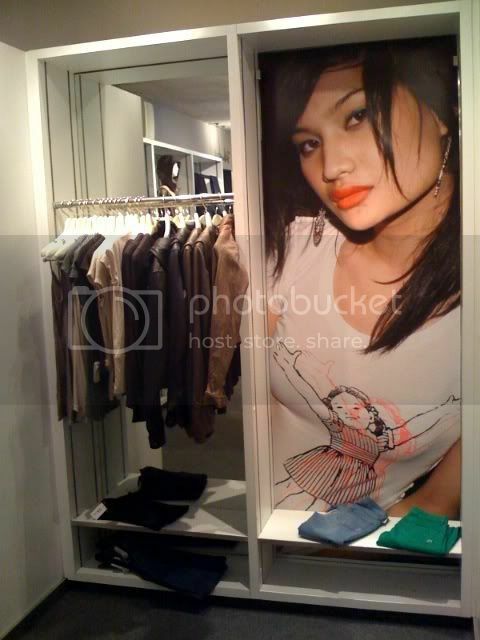 This month Ron Herman/Fred Segal launched a new instore campaign using all images by Shadowscene(Ellei) for decor. Larger than life prints adorn three of the four Los Angeles stores! Metromix listed the top 20 Ladies of the Night which included Ellei J. Also on the list were Samantha Ronson, Ana Dim Mak, Gina Turner and more. Ellei interviewed by the LAist this month and included in some sort of hipster something or another. Eh’, read it. Ellei spent a day with the Paer crew back in November and this month a full page ad for their line was featured in AP. Check out the ad photographed by Ellei! Hush Hush Attack, an LA based entertainment/arts newsletter web thingy has chosen to interview Ellei J. Read the interview here! LOUNGE Magazine from Cairo, Egypt lays out two pages and an article on Ellei J. International Mania. We love this blog…and thanks to them for posting our photos! We spent about five days in the amazing city of Chicago…and partied with Daft Punk, The Faint and The Rapture…and these guys were with us the whole time. Trashy fun! Ellei J. hits up a new glossy with Data Rock photos published in this month’s Big Shot magazine!! Yay! Shadowscene’s first colaboration with Los Angeles Metromix is now up…a photo feature on Morrissey. This month’s issue of Alternative Press features a press photo by Ellei J. for Oh No! Oh My! as top 100 Bands to watch. Today, the LA times featured The Deadly Syndrome as one of the best upcoming bands…preview the Ellei J. photo used in the article here! The long awaited project by Susan Dynner is now hitting the film circuit, featuring photos by Ellei J. of iconic punk acts such as Youth Brigade, Oxymoron, Sum 41 and New Found Glory. Ellei photographs The Adored for the DEWARS ad campaign. Preview it here. And see more from The Adored’s photo shoot! Spank Rock is amazing…and we’re super excited this months URB magazine used a photo by Ellei J. in their issue talking about how rad the spank rock really is! Check out the February issue of PAPER Magazine featuring Ellei J. with a crew of rad Los Angeles folks. Yay! The insane madness of the Justice & MSTRKRFT show is displayed as a full page in this month’s URB! 11.10.06 | Shadowscene photo splash in BPM Magazine! 11.05.06 | We love OH NO! OH MY! So much so, that we spent a few days with the band during CMJ and took a trip to Coney Island. This month’s issue of URB Magazine features a full page of Shadowscene photos, coverage from the crazy San Frangeles event!! Preview it now! Peep a copy of the May issue of URB Magazine featuring photos by Shadowscene of the ESG performance in LA. Ellei parties. Ellei photographs. She also writes. So now, she’s the Editor in Chief of LA Open Bar…all the fun rolled in one. Ash & Ellei represent the Cryin’ Tiger collection in a review in the November issue of URB magazine. Not only is VH1 Remaking Vanilla Ice, but they are also including 3 of Ellei’s Ice images in the show. The Sounds management company has chosen to use one of Ellei’s images for their web campaign. Maja can really get fresh. October issue of SLAP magazine features photos by Ellei J. of Thom Yorke from this years Coachella Festival. Group shot of The Sounds used in article covering this summer’s Warped Tour. Selects from Ellei’s work in progress, “Night” on display through November. Ellei’s image titled “Boys” featured as a Finalist for the 22nd Annual Photography contest. Feature article on Ellei Johndro along with image “Canal Street 7am” from the Street Collection. Ellei’s first solo photography exhibit focusing on her Street Collection. Limited edition 35mm prints.